Graphic Witness artist Nidhal Chamekh and exhibition curator Kate Macfarlane discuss what happens to individuals caught up in political turmoil. 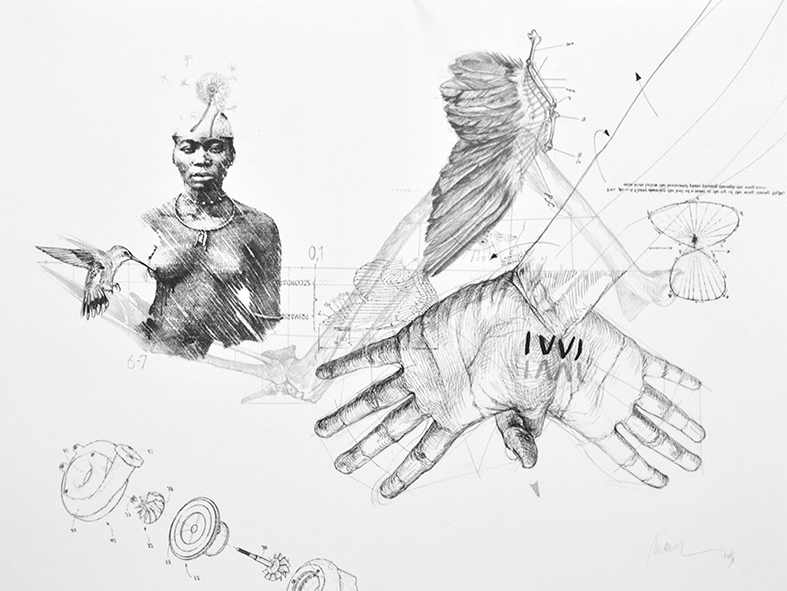 How can drawing provide evidence of injustice, create powerful commentary and prompt social change? 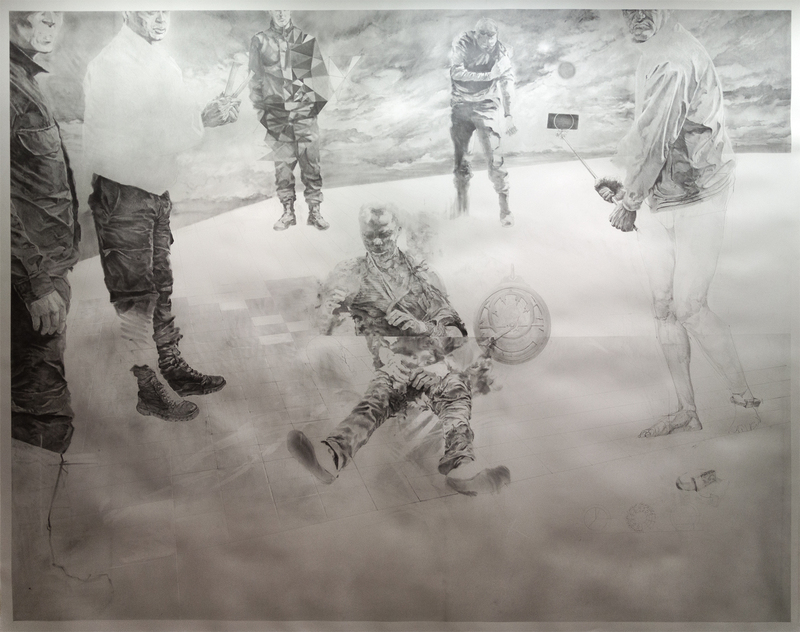 Tunisian artist Nidhal Chamekh deploys classical drawing as a forensic tool to uncover evidence of historic acts of governmental injustice and brutality in his native Tunisia and to produce both small and large scale drawings that comment on the unfolding political events in the region. Studying Circles (2015) takes as its starting point a newspaper image of a cigarette vendor who set himself alight in front of the Municipal Theatre in Tunis on 12 March 2013. This echoed similar incidents that swept the country in the wake of Mohammed Bouazizi’s self-immolation in 2010 – the act that became a catalyst for the Tunisian revolution and the wider Arab Spring. Chamekh was struck by the newspaper image of the horrific incident that took place in his home city of Tunis in 2013, which exemplifies man’s inhumanity to man. Nobody came to the newspaper vendor’s aid, even the attendant policeman simply watched as people photographed the event. In a more recent body of work Les Battement des Ailes (2016), Chamekh assembles heterogeneous elements such as stuffed birds, seeds and dried plants. These drawings symbolise the past, or death, but at the same time suggest the importance of looking to history in order to improve the future. Since 2011 Chamekh has lived between Tunis and Paris, and he is currently working on a series of works based on ‘The Jungle’, the refugee camp in Calais. 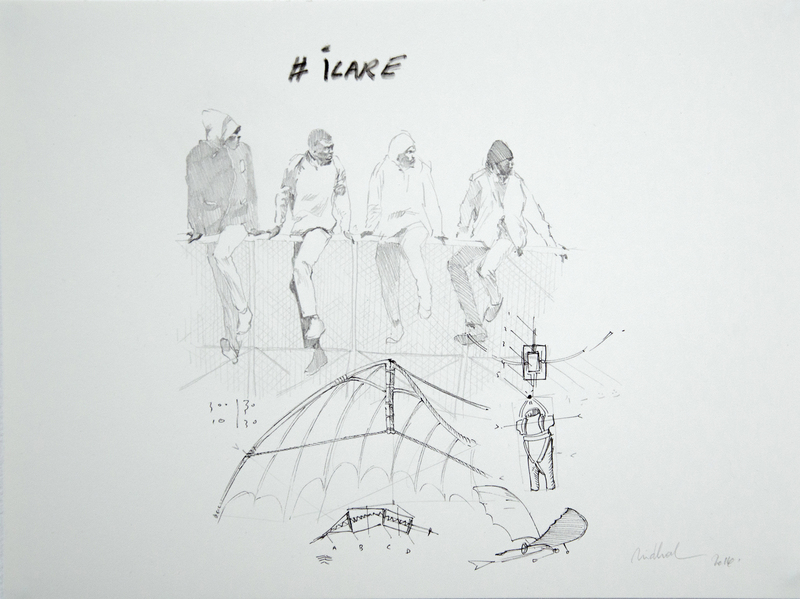 He began visiting the camp on a regular basis in 2015, and his drawings of strong, resourceful youths and ingenious shelters, such as #icare (2016), contest the image of the asylum seeker as downtrodden and powerless. Chamekh was present when the camp was dismantled by the French authorities and the video footage he shot informs a new body of work. *Please note, there has been a change to this event since original listing. All previously bought tickets are still valid.